Most siding styles have horizontal panels but that’s not the case with vertical siding. The panels run from the top to the bottom to give your home a distinct style. It’s a great option for your home in Milwaukee. The biggest feature that differentiates vertical siding form other siding styles is the vertical panels. Rather than having panels that run from side to side, they’re vertical. This is a great way to draw attention to your home and improve its curb appeal. Vertical siding is also a very versatile style. 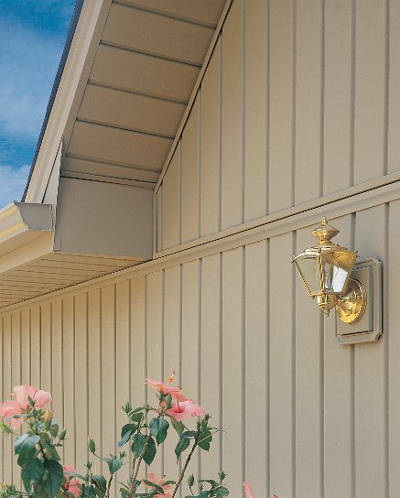 You can use it to side your entire home or you can use it to accent certain features or complement other siding styles. The choice is up to you on how you want to use vertical siding for your home. Looks aren’t everything. Vertical siding offers many other benefits. For instance, did you know you could save money thanks to your vertical siding? This is because it’s more energy efficient than other options. Behind the panels of your vertical siding is a foam board. This foam board prevents outside temperatures from sneaking into your home through the walls. This helps prevent your furnace and air conditioner from working too hard and forcing you to spend money on your energy bills. Vertical siding is easy to keep looking great. This is because, unlike its wood counterparts, it never needs to be painted or stained. The colors of your vertical siding are baked into the panels when it’s manufactured. Also, vertical vinyl siding is resistant to moisture. What that means is that it’ll never warp or rot. These are serious problems that need to be addressed immediately but you won’t have to worry about them ever when you choose Feldco. Vinyl is an extremely strong home exterior option. As we mentioned above, it won’t warp or rot. It’s also resistant to color fading and discoloration. That’s not all either! Vinyl shake siding has the foam backing behind the panels which will help prevent it from denting or cracking when it’s struck by hail or debris from strong winds. The foam absorbs the shock and keeps your siding looking great. The key to getting great vertical siding is finding the right company in Milwaukee. Feldco is the perfect company for you. We have been serving the Midwest for over 40 years and in that time, have helped over 350,000 homeowners with their home improvement projects. All of our siding is made from high quality final and is installed by factory trained and certified professionals. Get a free quote now and get started on your replacement siding project today.